http://m.stv.tv/news/highlands-islands/192374-island-home-of-ring-of-bright-water-author-to-remain-in-public-ownership/ Some seriously good news to brighten up a Friday night. There was a danger that the island could have been sold to the highest bidder and that the lighthouses and cottages could have been lost. The good folk at the Eilean Ban Trust are to be congratulated in raising awareness and drumming up support. And the Scottish Government are to be lauded for making it happen, especially in these difficult times when any cash injection cannot be overlooked. No more politics tonight. But a large dram to celebrate methinks. Glad I wrote to the Minister when I did, and that many others did likewise. Delighted the Minister had the best interests of the nation at heart and found a way to preserve this pretty unique place. It’s been quite a week, and it’s not over yet. But there can’t be more gifts still to come, surely? Well, along comes Johann Lamont, estwhile leader of Labour in these parts, apparently heid bummer to the London based members as well as the cooncillors, and she arranges a press conference to read a prepared statement. Now some of us are used to listening to her readings of prepared statements at her weekly appearance, her inability to think on her feet at FMQs, so expectations were low. I’ll spare you a link to that speech but it’s out there if you really want. Instead let’s just concentrate on what came next. Now there’s a lot to read on my usual outlets, Wings and Newsnet, links on the sidebar. But surprisingly I’m going to give you two sources that don’t often feature on these pages, the BBC and The Herald. Ms Lamont’s speech was staggering. She turned their manifesto from only a year or so ago on it’s head, and outlawed the policies of her colleagues in Wales which is of course the only part of the UK where her party holds any power, and confirmed what many have long thought. It doesn’t matter if they are red tories or blue tories – they’re all just bloody tories and there’s little more toxic in Scotland these last 30 years or so, save perhaps nuclear waste and weapons. So now we know, Johann wants to go back to means testing and to remove universal benefits that we can’t afford, while retaining trident missiles on the Clyde and continuing to wage illegal wars which apprently we can afford, among other things. First up is the BBC, and Wales politco Betsan Powys. It’s a rare event for Scottish matters to be open for comment on a BBC blog, for the Scottish ones have been closed down. But Betsan gave us the chance. Also worth reading is Iain McWhirter at The Herald, putting in writing what many of us have been stuttering over. Is it a manifesto for 2016, after the referendum, you know the time we get to elect the first government and really shape the future, the one we cannot predict at the moment because it is that government that will make the decisions, not the referendum vote? Or is it is suggested, a lengthy and detailed suicide note? Then we had FMQs today. Now Mr Salmond was absent, over in the States selling Scotland at the Ryder Cup, with the handover for the next tournament at Gleneagles in referendum year; so the deputy stood in. Perhaps it was that absence that dictated the timing of the speech, ignoring the impact of those other speeches on Saturday. Well the big man wasn’t missed for Ms Sturgeon managed to do what the FM does week in, week out, and to tear strips of Labour’s hapless leader. Today was no exception, but it was exceptional. Even Ruth Davidson joined in, welcoming the Labour leader to the tory fold. Before then however we had signs of Labour back-tracking on all Lamont’s promises – yes the 1,000 policeman are safe; of course free prescriptions will stay. Bus passes, well the wealthy don’t use them and means testing will cost more than any possible saving. It’s been monumnetal stuff, so do try and keep abreast. As a relief there’s some stonking satire over at the usual place. And there’s Alistair Darling, remember him, the Chancellor that reaped what his predecessor had sown and bankrupt the whole damn place. Well he now heads up the shambles that is Better Together and he’s given an interview. It seems that, as the two governments are about to agree that only one question will be put before us, he’s ruled out the other option, the one that most seem to want. No devo max, no devo plus, no jam tomorrow whether defined or not, for we have to realise we can only get what the tory government in Westminster will allow. So if you want those extra powers we all crave the only route is independence and the head of bitter th’gither telt us so. Now that gives only defence and foreign affairs beyond the common desire, so we may as well go there and get rid of bloody trident while we can. And the best gift of all? Well that’s silverware. Yes the team that has still to manage a league goal picked up the sectional league cup with a fine performance last night. This was the same trophy in which we had been three goals down at Mordor earlier in the season. Now three points on Saturday would just about make it the perfect week. Oh yes, it’s been quite a week and it’s still only Thursday. We reported on Saturday that wind turbines could potentially occupy nearly 10% of Scotland’s National Forest Estate.In fact, the area that could be covered would be at most one-third of one percent. Between 700 and 1000 turbines are expected to be erected on the estate, not, as we reported, a quadrupling in the number from about 850 to more than 3200. That was following an article at the weekend that was clearly so vastly wrong that some swift action was needed. Just a tiny wee mistake then, or deliberate misinformation? What the apology does not tell you is that the original piece centred on a photo of the First Minister over a forestry background – highlighting the apparently scandalous sell-off by the government of vast tracts of forest land, the replacement of pines with turbines. Nice to see standards plummeting as fast as the circulation figure is it not? The apology though is just a tiny paragraph, and does not appear online. It was a fine day for it, a trip to Edinburgh. The sun shone, all day long, warming the faces of the righteous, gathered in their throngs, and their chain mail and their kilts. And there was flag waving, from Flanders and from Venice, Catalan too, saltires even, by the thousand. Eventually we left The Meadows, heading for Princes Street Gardens. As the gun from the ramparts marked the hour, so they poured into the arena, taking up space on the gras beyond and on up to the railings of Princes Street where shoppers and tourists stopped and stared. And against the backdrop of those castle walls so we rose and began to be a nation again. It took at least 45 minutes for all to get on the road and as the pipe band were leading the front line in to the Gardens, so the last were still in the park. Lokk forward and back along the road and you could see saltires and banners, marchers young and old as far as you could see. These were not activisits, this was the woman next door, your cousin’s children, the granny that picks up children at the school. They were aged across decades from babes in arms to grannies and beyond. The press pack were out in force, with cameras and lenses sufficient to shoot a duchess. Even the BBC sent along a fim crew, and a cub reporter. He must have spoken to someone, for I saw him there, but not yet on screen. There were speakers and there was music. Dougie McLean singing his own haunting, Caledonia, had the hairs on the back of the neck standing up, heck even the ones on the palms of the hand. The on-stage event was managed, with neither a hue nor a cry, by Pat Kane. He introduced the First Minister and the rabble were duly roused. Then Margo, talking sense as always. Her brother once taught me PE, failing miserably. But the best of the speeches came where least expected. Indeed two were from Labour stalwarts, yes that’s right this was a-political. Denis Canavan chairs the Yes campaign, after more than three decades of parliamentary life mostly wearing the red rosette. But he knows what is best for our nation and what we have to distance ourselves from. Allan Grogan, from the unlikely named Labour for Independence, explained just why, and it all made perfect sense. And then there was Ruth Wishart. She had a fine article in that morning’s Scotsman and she told us just why she could no longer be just a journalist sitting on the fence. There’s a Favourite Uncle, mine not the weans, an ex-pat of nigh on half a century, who remains a good pal of Ruth and will be stirred by her speech, if I can get it to him. The article was awiting my return, the only paper bought these days, for the Book Reviews you understand. Read it here, for it is good, but don’t try posting any comments to it for The Hootsmon has a reputation to defend though we should be thankful that they allowed Ruth her say. So here’s a link to speeches, though I haven’t had the chance to listen through just yet, and Ruth may or may not be there. But you’ll want to see the pictures and to hear the comments, and as usual it’s the blogs which are best for the BBC is not the place to go. Great coverage over at Wings Over Scotland; satire at BBC Scotlandshire; and the international flavour, strangely far greater coverage than our own state-funded broadcaster, over at Russia Today. Take your time, and get a flavour of the day. I expect you all to be there next year. I know I will. As Margo said, if we each get another to buy in, then Yes We Can. PS I’ve changed the link to Ruth Wishart’s article to Yes Scotland, rather than giving The Scotsman more clicks than they deserve. And another great summary over at Bella Caledonia. …….. there was sun and it was bright, unmarred by cloud, and the wind stirred not at all. It was the aftermath to the deluge. Waters that had gathered where none usually build had receded. The torrents that had been the burns ran brown but the churning waters had stilled. Down by the school the goalposts rose a couple of feet above the surface. And out on the roads was the rare appearance of – a grasshopper. It had been far too long and chains and knees had seized; lashings of oil; swathes of lycra that had been on the point of being put away for the winter to be replaced by a heavier weight and an extra layer or two. It was a day that had started strangely, for three chickens roamed the garden, even before the coop had been unlocked. Within the mesh run the other two begged for release. Soon they were reunited, all five bulked up as feathers were opened to dry in the warming sun, still bedraggled and soaked from the day that had gone before. It looks as though those house martine may have made their saharan escape for the coming of the rains, the nest silent at last. Birds of a larger kind flew not, and the air remained unpolluted by that annoying little jingle from Ryanair, as the airport down on the coast had succumbed to the rising waters. Atop the pole sat the buzzard, the size of an eagle it seemed, as more feathers were opened and warmed. And on the tarmac, less than a mile from home, lay a ginger rug. There was a cat that had been missing for a couple of weeks, but this could not be it, surely. Then slowly it stretched and rose, and trotted away in fear of a vision in high-viz hurtling along at the pace of a lame sheep. Fox it was, large dog, and too close to too many chicken huts. I’ve not seen one this close for many a year, most of them eschewing farmland for the easier and richer pickings of the urban gardens and the detritus of the towns. Slowly it found the gap in the fence and disappeared down by the burn. And so we went on, splashing through casual water, up and down the gears, breath rasping, knees complaining. But it was a fine day, as rare and unexpected as it was welcome. The cairn at the top of that lump of rock was busy, the car park unusually pressed for space. Mid term it was, the schools on a long weekend, and the sun shining. Whatever next. Well it stayed that way and in fact it got nicer as the day went on, until the turbines on the far horizon slowed and eventually stopped altogether. Washing even dried on the line, for there was genuine warmth in the air. Mindful of the threat of fox I dutifully went out again at dusk, to secure the run. This time all five had bedded down in the right place, the old hen-hut lying empty as it should be, save for the evidenc of squatters. And then I saw it, against the gathering gloom. A wraith it was, not twenty yards away. Downslope, against a background of shrub. And it lifted and swooped, soundlessly. To the west the sky darkened by the minute in that half light. No lights shone out from distant cottages, no sound rose from the road far away. Closer it came, then turned, never rising more than a yard from the ground; maintaining the same height across the slope of the field before disappearing into the murk of the valley floor and the rushes and the reeds. It’s not often I get to see the barn owl on the hunt, quartering the ground. But it was an unusual day from the start. And it looks as though we are to be blessed again. For the dawn brings the first real frost, thick and white, hoary even, and a mist filling that same valley floor. Above there are no clouds save for the lightest shimmer to the west, the red tinge evidencing the imminent arrival of the sun from behind the eastern hills. It will be a golden day under a canopy of blue. Thus far the fingers are chilled; the chickens are free and the grasshopper remains shed-bound; for there’s a train to catch. And I’ll tell you about that soon enough. There are two books on the go at the moment, one for the day, at the kitchen table, the other at the bedside. Both are so good I have to tell you about them before even reaching the final chapters. They have that ability to take you elsewhere. First up, from the kitchen table, is from John Baxter, he who I discovered as a guide to the backstreets of Paris. Brought up in deepest New South Wales, taking a job with the rail company as he knew it would get him out of town, he hails from the type of place where there is no book in the festive stocking, for there is already one in the house. His traipse round Paris unearthed a fine writer, with a catalogue of written works to his name. One of those, A Pound of Paper, tells of his life as a book collector, and subititled Confessions of a Book Addict, may not be for all. However the fly leaf tells of a man living in a Paris penthouse with a library worth millions. He tells us how it came to be, and there’s much more to it than books. I’ll spare you more, for I have to tell you about the one on the bedside table. Suffice to say if I happen to be in Paris in a couple of weeks I really should contact Baxter and ask him to scribe a dedication on my first edition of his decade-old narrative among the barrow boys of Brick Lane and across the globe with Greene and Amis and many others. Ideally I’d like one of his personal Parisian tours, but a book signing, now that would be good enough. But it is Otter Country that I really want to talk about today. For Miriam Darlington has penned a beauty. It is a book I opened from the back, keen to see the bibliography, those readings and sources that have been scoured in the writing of this one. I scan down, mentally preparing two lists; the second of works I’d like to see join the first on the shelf. There are sublime writers on view: Douglas Botting, whose daughter Anna reads the news; John Lister-Kaye and Robert Macfarlane, Maxwell and Willamson of course, and Kathleen Jamie. And there’s Barry Lopez and Kenneth Grahame, Kathleen Raine too, she who gave Maxwell his title and carried the curse that saw Mijbil’s tragic end, and many more. Like Jamie, Miriam Darlington is primarily a poet, and that is evident in her prose where every word is carefully thought out and placed with precision. Photographs are not needed in Otter Country, though there are delightful sketches, for Darlington paints every scene perfectly. She has the ability to transport you to other parts. Immediately I am reminded of the times I have glimpsed an otter in the wild. There was that day, on the banks of the Avon down by Chatelherault, between the railway viaduct and the old Cadzow Bridge. FirstBorn was old enough to dip a net in the water and to tell a stickleback from a baggy minnow. Little sister was far from being prodigal, and didn’t fall in. Granny was young enough to wander muddy river banks and get wet and muddy. And on the far bank, and it was a distance just a mile or two upstream from where the river flows into the Clyde, there was a movement; we both saw it. Never heard of otters here, not way back then; might have been a mink. But on Jura it was otter; running along the wall between road and rocky shore, teasing and playing, immune to the appraoch of a car but disappearing as soon as the camera was found, leaving nothing but ripples on the surface and bubbles rising. And close to home now is that same Avon, a bit more than a burn, less than a river. Feeding into it is the burn that passes at the foot of the hill, and there’s been an otter sighting in the last couple of years. In fact the man who saw it has just dropped by, interrupting these thoughts, but leaving a couple of bags of Bankend Bangers, from his own Tamworths. I’m minded that we need to do some otter watching. Darlington introduces us to Jimmy Watt, still living in Glenelg, and to Terry Nutkins, so recently succumbing to his cancer. And immediately I’m back at Sandaig. For I too have made that trip down the hill through the trees, and I too have seen the first rays of morning sun put the bright onto that ring of water; and put a pebble down for Edal. And I too have sat for hours in that hide above the sound, glasses glued to the face and watched for movement and signs and been devoured by midges. It’s a book that I suspect Craig who runs the shop in Glenelg may just have on display, with other Maxwell related works, beside the local ales and the local drams to be taken over the sea to Skye. And I long to be back on Eilean Ban and that long room. The old lighthouse-keepers cottage would make the perfect writer’s retreat. One day. But there is much more to Miriam Darlington’s trail round otter haunts than Gavin Maxwell. We’re in Tarka country and Cornwall and Wales too, where she tells of the land that was once farm and is now nature. She follows the trail and gives us an otter’s eye view; getting down and dirty, sniffing the spraint and inspecting the foodstuffs. You wouldn’t think a lutrine latrine could be interesting, but suddenly I want to get my wellies on and get out there. She takes me to Fowey and I remember arriving there on the day of the festival; a day it seemed when the locals broke fast on scrumpy and devoured nothing else all day long, whilst dressed as if in Bedrock. It was a while before we took the ferry that day. It must be thirty years ago now, but like that first otter it seems like only yesterday. There are times when I think that one of Laurence Broderick’s bronzes would look good by the bookcase; a good investment even. Much like an inscription on a book. I need to go now, for I think of Thesiger and two very different tales of travels with Marsh Arabs in terrain that exists no longer. Chahala. And if you happen to be in Wigtown in the next couple of weeks – sod it, she’s on a different day to Tahir Shar, and I fear I’ll miss out on both. I’ve been enjoying hugely the latest run through our historical past from Neil Oliver. Vikings, on BBC2, has been terrific viewing. The shores down the road from here were found by our Scandik cousins centuries ago, and their legend lives on to this day. But Oliver has been telling us the real extent of the Viking voyages, travels where landing on obscure Scottish shorelines were but a tiny part. And watching it has been re-living visits to favourite cities. Last night we had footage from York and Dublin, both marvellous venues, but what I enjoyed most was a return to St Petersburg, and a glimpse of the one that’s still on the wish list, Istanbul. That vast frontage of the State Hermitage along the semi-frozen Lena took me back to nipped ears, and had me keen to make a visit to Edinburgh before the Catherine the Great Exhibition closes next month. The National Museum has several times brought parts of The Hermitage collection to our capital. Well do I remember the Islamic Art, and much do I rue missing the Treasures of the Tsars. So the current one will get a visit. We were treated too to a glimpse of the Andropov Bridge, and to the domes and spires of the Saviour of the Spilled Blood. Then it was on to Istanbul, and the Hagia Sophia, a journey the Vikings would have made by river, intent on opening up The Silk Road, the way to Samarkand and Tashkent and treasures unimaginable. We were treated to a reading from Ibn Fadlan, who made that trip in the reverse and what a tale that is. But our reading was from the Arabic, with a rich Scots brogue. So while Oliver told us of slavery from Dublin, and the founding of Europe’s best wee capital, and counted out the coins minted in Asia, we learned of the world centred on the shores of the Baltic and I thought of the amber that fills the maket stalls of Riga flowing down those great rivers from the heart of Europe. Grave goods, I think that’s what I’d like. It’s how they now tell a religious burial from a viking one. I was left wondering what I’d take with me; perhaps a book to read on the way. But wait a minute there is no ‘way’, no journey, for I’ll be content to fertilise a tree. Still, a book in my hand would be nice, a first edition perhaps. Now there’s a thought, which book to take with me? And whilst we’re on the subject of Scandinavia, how long do we have to wait for the next series of Borgen? I’ll have more on books shortly, for I’ve a couple of crackers on the go at the moment. Meanwhile the seasons change; witnessed by the scraping of ice on the windscreen and that rich smell of dried fruit soaking in nectar. Yes it’s that time again, and still the mower has work to do, and still there are house martins poking out of nests. I’ve long been a sucker for tales of derring-do, especially if polar regions are involved. Some of the best tales have been weaved around the toughest of times, and a century later we still know relatively little of these far flung and inhospitable outposts. That said our fears now perhaps revolve around ice-melt, and tourism. Back in 1897 it was a bit different. We knew that Antactica was a land mass, but the pole remained a lure, one of the few remaining. The North was more mysterious, for exploration above the Arctic Circle had centred on the quest for the North-West Passage, and the search for lost questors. That was when three Swedes; Andree, Fraenkel and Strindberg set off. They were backed by Nobel, amongst others. They knew not if the Pole was on land, an island, water-bound or whatever. 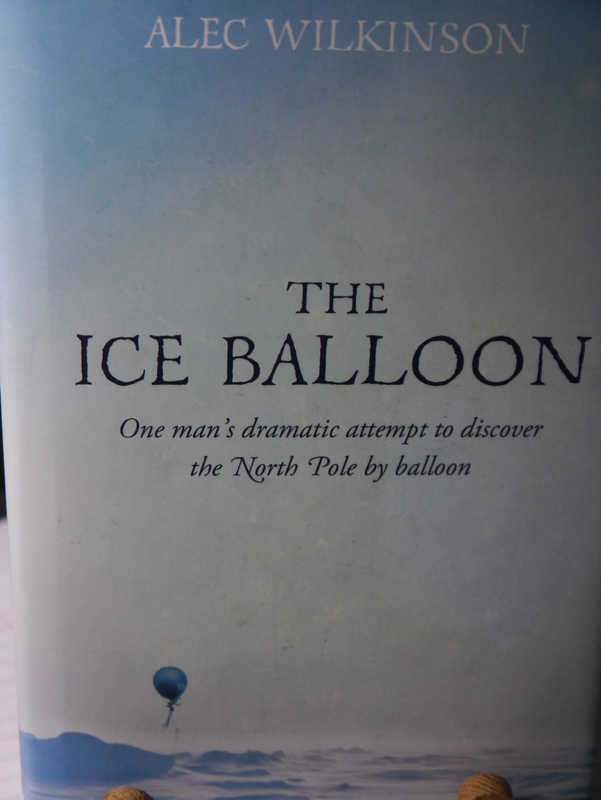 In The Ice Balloon, we hear from Alec Wilkinson not only the adventures of these three men, but also of what had gone before in northern times. Nansen had tried, failed and survived and we hear of the years he spent lost in the frozen wilderness, adrift on floes, before being miraculously found on Franz Josef Land. We hear too of Greely’s attempt, and of death and the ultimate source of food. I hark back to reading, as a youngster, Clay Blair’s account of the Andes plane crash and the route to survival. The eating of human flesh was taken further by those Nantucket whalers adrift in the Pacific, drawing lots to chose the next meal and drawing lots again to select the executioner. Greely’s party also had to resort to the remains of the dead, so it seems. They didn’t make it. The balloon stranded between layers of cloud and fog and eventually came down. They took to the ice, a consequence not unforseen, and they had equipment and plans. But sledging was tough work and progress was slow. After three weeks they discovered that their eastward progress across the ice had been matched by the westward drifting of the floe. So they headed south-east, and drifted south-west. Food was not a problem for polar bears were plentiful in those days and they were able to shoot their fill; able too to mix the diet with occasional seals and gulls. We know all the details because Wilkinson has scoured the letters and the diaries. We do not know what ultimately killed the three men. They had settled in for a winter on the ice, then the camp broke up, with men and food, sledges and boat, separated by leads of water that had broken through. It does not look like they died at the claw of the bear; at the end of a gun; or of starvation. Illness and disease perhaps. It’s a first class account, put together from the notes made by three pioneers who didn’t survive to tell their tale. We can view it now, with the knowledge of film footage from the Arctic ice today of just how tough the terrain was, how difficult it is to haul a 300 pound sledge over huge lumps of ice, even with all the assistance and technology of the current age. We know that today the art of the balloon pilot relies hugely on prevailing conditions. There’s photographs surviving, and a film from Kodak warning that it needs to be used by 1898. It’s a cracking read, a look back at tough times, exciting times, and tough men, and it’s very well told.